As a snowboarder from Hong Kong, I’ve been to China many times. Going to China for skiing or snowboarding is not just about the snow, it’s about exploring, experiencing and adventuring. All you need to do is plan your trip well and be prepared. In this guide, I am going to share some hands-on tips with you regarding your China skiing or snowboarding trip. Hope you find them useful. It is kinda annoying that you Google, Facebook, and many other social media site did not cope so well with China. Therefore, if you are very relying on non-Chinese apps like Facebook, Twitter, WhatsApp, Google’s services like Google Map, Gmail, then congratulations! You are really having a holiday because you just simply cannot load any of these applications! Having a working VPN allow you to connect to an “Outside of China” server like Hong Kong, Japan, Singapore, USA, or Europe. However, make sure you download your VPN when you are still outside of China, once you enter China area, these VPN downloads will be blocked. It’s best that you have at least two VPNs in case one doesn’t work very well or get shut down all of a sudden. I’ve been using ExpressVPN for a long time, it’s fast, stable and has lots of lines to select from. Plus, ExpressVPN offers a 30-day no negotiation money back guarantee which means you can literally use it for free if your China trip is less than a month. Of course, there are tons of other options on the market. It is quite often that you are going to fly from one city to another in China, you’ve already paid for your visa, so why not use it well, right? Here are some tricks that will make your China domestic flights journey easier. Bring yourself a fully charged tablet/ kindle/ book, from time to time, the Chinese government may apply much tighter control on aviation safety. I have experienced several times that everybody was asked to switch their phones off upon onboard, even flight mode is not allowed. There was once I gotta take a 5 hours flight from Shenzhen to Xinjiang, and the flight attendant told me I had to keep my phone off during the whole journey. It was 11 am in the morning and I just had an 8 hours sleep so there was no way I can sleep again on the plane and they didn’t even have individual televisions for the seats. Luckily I had my fully-charged, loaded-with-movies iPad with me or else thought I just gotta ask the flight attendant to give me a piece of paper and start to write my blogs by hand. So yeah, be prepared for your domestic flight, bring yourself a book or something to kill time. Do not bring any expensive lighter or portable power bank over 10,000W into China, simply because you are not allowed to bring these to the aircraft. Try to avoid flying to or passing by Beijing and Shanghai, unless you love delays. Most of my friends, including myself, had around 50 – 70% delays experience for our Beijing and Shanghai flights. So yeah, it may be a wise idea for you to avoid flying to these two cities. Regarding traveling, unlike many other countries, China is very famous for high-speed train (also called bullet train). Most of the time it’s much more convenient yet cheaper to travel from one city to another with the high-speed train instead of flying. Plus, it’s very unlikely that you’ll encounter unexpected delays. For example, you can take G80 (Shenzhen to Beijing) which leaves at 8:16 am in Futian and arrives in Beijing around 5 pm. One of my friends takes this route multiple times a year and he barely meets delays. You can learn more information about train tickets from this Ctrip page, or directly order your train tickets from the official website here. Note that you’ll need your passport and a Chinese bank card to purchase the ticket. I highly recommend you have a Chinese guide or friend to do this so you save time and hassles. Because Chinese citizens can order train tickets directly on their mobile phones and pay via WeChat or Alipay. So unlike other developed countries, if you are injured or sick and you collapse in front of a hospital, the medical staff would rush to you and save you first and you can pay the bill later. It is very common in China that you will have to pay first before you get treated. So for safety reason, do make sure you buy your travel insurance in advance and find a hospital that speaks English once you landed at every airport. It is very common that the fee is higher in English speaking hospitals. So make sure you buy travel insurance and check the coverage before your trip. And very likely you can claim delay charges! Don’t worry, China is safer than you were expecting. Yes, they have really bad traffic and air pollution problems like India. But China is very safe for solo female travelers. The train stations, areas with loads of people are usually under very straight control by the police. It is quite common that you need to scan your luggage before entering the subway! But for sure, keeping an eye on your luggage is always a good idea. Be smart but don’t get over stressed. Getting a local number is always useful for your trips, however, getting a local number with Internet access in China is particularly useful. That’s because over 90% of communication, promotion, payment are done via mobile payment by WeChat and Alipay. It is quite annoying that the biggest face amount of their money note is just RMB 100 (around 16 USD). So it is kinda difficult for you to put all your money into your physical wallet. Therefore, most transactions are going to be done by WeChat Pay or Alipay. For example, during my last snowboarding trip to the indoor ski resort in Harbin, I need to pay an additional charge for my 4 hours ticket because at the end of the day, I spent almost 6 hours inside the resort. So I asked if I could pay my transaction fees by cash, the cashier asked if I could pay by WeChat Pay or Alipay. People tend to use these two apps for payment even they are buying just two bottles of water in a convenience store! However, in order to activate your WeChat or Alipay Wallet, you need to have your own China phone number first. And you do need to have Internet access when you make the payment. Most stores or restaurants would provide free Wi-Fi, but when you are taking taxi or buses, it’s much better if you have your own Internet access. WeChat – kinda like a mix of Whatsapp, Facebook, and Apple Pay that’s very popular in China. Most people in China communicate and make payment via WeChat. I booked almost everything of my trip from Harbin to Jilin via WeChat, the car, accommodation, restaurant, sightseeing tickets, etc. I just love using WeChat Pay or Alipay to make my payments, other than the small face amount of Chinese money notes (as I said, the largest face amount was just CNY 100 = USD 16!!!! Imagine how thick would your wallet be if you need to book a plane ticket costing CNY 3000) Also the Chinese money is … hum… kinda disgusting and stinks… imaging a piece of paper that’s been held by like 10000 very sweaty hands. That’s what you get back most of the time. Alipay – as mentioned, this is another very popular payment method in China other than WeChat payment, but there is just no messaging and sharing functions in Alipay. Amap – Chinese version of Google Map, even with your VPN on, it may be very slow when you try to load Google map, using Amap may be a better idea and they have very user-friendly interface too. Ctrip – this is like the Chinese version of Agoda and booking.com. Most of the time it costs the cheapest to purchase Chinese domestic flights, and there are more options for flights too. Normally I book my flights via Ctrip and hotels via Booking.com, Agoda or Hotels.com. As mentioned in my another article regarding the world’s biggest indoor ski resort in Harbin, the Language barrier could be a big problem for your trip. The easiest way is for sure find a reliable expert to guide and plan your trip, or else you may consider to bring along a portable translator with you. According to this CNN article, the Pleco app could be very useful too. Or at least, always bring along a business card of your hotels and accommodation so you can show it to the taxi driver. Always drink bottled water and boiled water only. Always bring along your own toilet roll. Always plan for your China visa in advance. Be flexible and accept changes and delays. Make use of the very well developed courier network, they are fast and cheap, send out your large luggage to the next hotel and bring along only your small hand carry suitcase would always make your traveling easier, especially when you are taking the trains. Always wear your helmet, and be alert. It is quite common that you will find people who are totally not prepared for skiing or snowboarding sliding really fast down on the slope, sometimes you can find a guy who is wearing his jeans, screaming because he’s just simply out of control or crash onto something. It is quite often they have no clue about what they are doing. So be extra alert when you are close to the beginner area. Consult a Chinese snowboarding expert such as SnowPantherHK before going there, or at least get their number, if anything happened, just call them, at least they can understand your situation and talk to the service provider. DO NOT buy any brands product in China as they are going to be super duper expensive because of the import tax. However, the price for Chinese brands or no brands product could be very affordable. Ooo!!! They have very cute turtle production pads by the way, very funny indeed!!! Right… it seems like there is a lot you need to pay attention to when you are going to China, but then your dividend will be paid. Going to China is a whole new experience, going for a normal snowboarding holiday in Canada, Europe or the States could be fun, but going to China is more like an all-round excitement, their food, culture, people, mountain… You will find it very impressive for a single country to host so many different cultures and people. 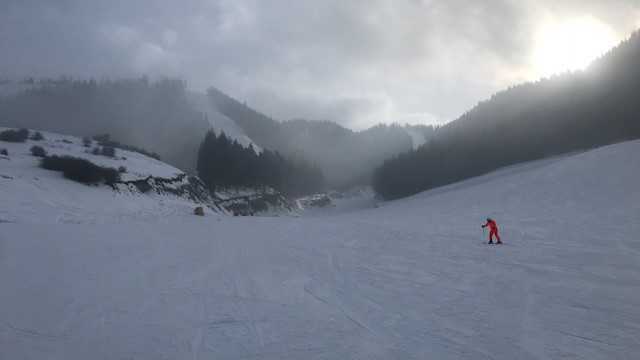 Skiing and snowboarding in China could be fun, exciting, cheap and nice. For example, the price for heli-snowboarding in Altar, northern Xinjiang in China is just 1/3 than the price in Canada or the United States. Just only in a town in the northern part of China, there are already 32 species of people living there. You can find 10+ different types of cuisines on a single street. This is how condense it could be in China. It could be shocking, exciting, complicating. © 2019 SnowboardHow.com | Disclosure: As an Amazon Associate I earn from qualifying purchases.